It's now 94 days until the kickoff of Catamount football on September 2, 2017, in Aloha Stadium, Honolulu, Hawaii - home of the University of Hawaii Rainbow Warriors. Prior to Western Carolina: Finished with 164 career tackles including 27 tackles for loss and 16 sacks ... Forced five fumbles and blocked two field goals ... Named All-North Piedmont Conference as a senior, as well as garnering all-county honors ... Two-time defensive lineman of the year ... Played in the 2012 Eastbay Youth All-American Bowl as an eight-grade offensive lineman ... High school coach was Rob McNeely ... Also participated in track & field as a prep where he holds the school record in the discus. Personal: Is the son of Kell and Susan Helms ... His father played football at Western Carolina from 1986-90 as a linebacker ... Has a younger sister, Reagan. It's now 95 days until the kickoff of Catamount football on September 2, 2017, in Aloha Stadium, Honolulu, Hawaii - home of the University of Hawaii Rainbow Warriors. #95 is currently not assigned, so we'll highlight another Catamount assistant coach. Mark Rhea came to Western Carolina in mid-March, 2010 as the defensive line coach and was promoted to the program's recruiting coordinator during the spring of 2011. Under head coach Mark Speir, Rhea continues to hold the top recruiting position. After two seasons of specializing in coaching the defensive ends, Rhea resumed coaching the entire defensive line as a unit during 2016 spring drills. Remaining on board from the previous WCU coaching staff, Rhea was elevated to Assistant Head Coach in late October of 2011, and then on Nov. 13, 2011, was named Interim Head Coach and led the Catamounts against Coastal Carolina on Nov. 19, 2011. During the summer of 2015, Rhea was again promoted to the Assistant Head Coach level by Speir. Under the watchful eye of Rhea, WCU's defensive ends continue to develop along the defensive line. In 2014, Caleb Hawkins garnered second team All-Southern Conference accolades from the voting media, leading all of WCU's defensive linemen with 54 tackles including 27 solo stops and 11.0 TFL. Rhea, who played and coached at the University of Toledo, joined the Catamount coaching staff from Division II-member, Tiffin University. A four-year starter at the Univ. of Toledo from 1988-91, Rhea got his start on the Rockets' staff serving as an administrative assistant and graduate assistant from 1992-94. He has served as a defensive line coach at four different institutions and most recently was the defensive coordinator last season at Tiffin University in Ohio. Prior to his stint at Idaho State, Rhea was on the staff at Austin Peay and before that he coached at the United State Coast Guard Academy in Connecticut. In his career, Rhea has mentored three players who have gone on to the professional ranks. In 2006, he coached J.P. Bekasiak, who later became a first-round pick of the Hamilton Tiger-Cats of the Canadian Football League. Rhea also coached two players at Idaho State who went on to the NFL in Jared Allen with the Minnesota Vikings and Jeff Charleston who played for the Super Bowl Champion New Orleans Saints last season. Allen, a two-time All-American and winner of the Buck Buchanan Award as the I-AA Defensive Player of the Year in 2003, was drafted in the fourth round by the NFL's Kansas City Chiefs in 2004. Charleston had 19 tackles for loss and was the Defensive Newcomer of the Year in the Big Sky in 2005. He signed as a free agent out of college with Houston in 2006. After earning his bachelor's degree in athletic administration from Toledo in 1992, Rhea assisted the Rockets' coaching staff before working two seasons as a graduate assistant at Michigan State. The Beavercreek, Ohio, native had a standout playing career at Toledo that saw him named the team's outstanding defensive lineman as a senior and play a pivotal role on the Rockets' 1990 Mid-America Conference (MAC) co-championship team. Rhea and his wife Stacey have a daughter, Madeline. It's now 96 days until the kickoff of Catamount football on September 2, 2017, in Aloha Stadium, Honolulu, Hawaii - home of the University of Hawaii Rainbow Warriors. 2015 (Redshirt Sophomore): Played in nine games as a reserve along the defensive line and on special teams ... Recorded 31 tackles including 13 solo stops and three tackles for loss ... Recorded tackles in each of the nine games in which he played ... Forced and recovered a fumble against Presbyterian (Oct. 2) ... Tallied half a sack against Mercer (Oct. 10) ... Posted a career-high seven tackles including three solo stops at Wofford (Oct. 17) ... Credited with one quarterback hurry and batted one pass down at the line of scrimmage ... Recorded five stops including three sacks in WCU's annual Spring Game. 2014 (Redshirt Freshman): Played in 10 games as a reserve along the WCU defensive line … Credited with four tackles including two solo stops … Made his collegiate debut in the home-opener against Brevard (Sept. 6) with his first career tackle coming at Furman (Sept. 27) … Converted to linebacker during 2015 spring drills … Playing for the Purple squad, recorded six tackles including two sacks in WCU’s annual Spring Game. It's now 97 days until the kickoff of Catamount football on September 2, 2017, in Aloha Stadium, Honolulu, Hawaii - home of the University of Hawaii Rainbow Warriors. 2015 (Sophomore): Played in all 11 of the team's games with three starts at defensive tackle ... Finished with 15 total tackles including five solo stops ... Recorded 3.5 tackles for loss including half a sack against Furman (Nov. 7) ... Posted three tackles in three games ... Credited with five stops including a pair of sacks in WCU's annual Spring Game ... Named to the 2015-16 Southern Conference Academic Honor Roll..
2014 (Freshman): Saw action in all 12 of the team's games with seven starts along the defensive front ... Finished with 19 tackles including nine solo stops and half a tackle for loss ... Made his collegiate debut in the season-opener at USF (Aug. 30) ... Made his first career tackle against Brevard (Sept. 6) ... His first collegiate career start came at Furman (Sept. 27) ... Had two streaks of three-consecutive starts in a row ... Credited with a career-high six tackles in the home win over Wofford (Oct. 11), adding a blocked kick to his tally ... Named to the 2014-15 Southern Conference Honor Roll ... Playing for the Gold squad, credited with two tackles including one for loss in WCU's annual Spring Game. 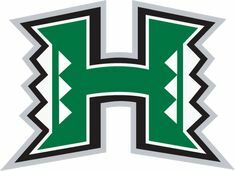 It's now 98 days until the kickoff of Catamount football on September 2, 2017, in Aloha Stadium, Honolulu, Hawaii - home of the University of Hawaii Rainbow Warriors. To help pass those long summer days until football season starts, and hopefully get the Catamount faithful more excited about the upcoming season, we'll continue the 100-day football countdown each day until kickoff day. Prior to Western Carolina: Played on the varsity squad for all four years as a prep, beginning as a freshman with the eight-quarter rule ... Was a two-time All-North Piedmont Conference selection and was twice dubbed all-county ... Recorded 163 career tackles with 50 tackles for loss including a career-best 31 as a senior ... Had five career sacks ... Was a part of a two conference championships as a freshman and senior ... South Iredell HS won the state championship his freshman year ... High school coach was Scott Miller. Personal: Full name is Holden Kross Edwards ... Is the son of Don Edwards and Kathy Barrow ... Grew up on a farm, working with his father and grandfather. Brad Glenn joined the Western Carolina University football coaching staff in 2012 after seven years at Appalachian State. He works with the Catamount quarterbacks while also serving as the program’s offensive coordinator, bringing the spread offensive formation and the read option that he worked with at Appalachian State to Cullowhee. In his short time at WCU, Glenn was instrumental in molding quarterback Troy Mitchell who flourished in Glenn’s system. Mitchell finished his career as WCU’s all-time career leader in total offense with 9,397 career yards. 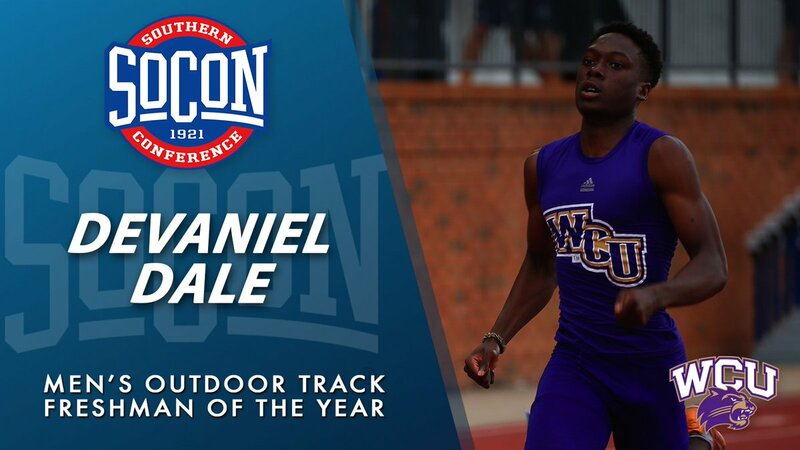 Under Glenn’s guidance in 2012, Mitchell – an All-SoCon selection – rushed for eight touchdowns, the most by a quarterback at WCU in program history, according to available research. Then in 2014, Mitchell broke the program’s 14-year old record for total offense in a single-season, amassing 3,096 yards including passing for 2,541 yards and 20 touchdowns and rushing for 555 yards with six scores on the ground. Not only has Mitchell excelled at quarterback under Glenn’s tutelage, but two receivers have posted double-digit receiving touchdown tallies in his system. In 2013, Karnorris Benson matched the school’s single-season receiving TD record with 12 scores, while Spearman Robinson caught 11 touchdown passes in 2014, both earning All-Southern Conference accolades. Prior to his move to Cullowhee, Glenn spent three seasons as the quarterbacks coach while also serving one year as tight ends coach (2005) and three working with the slot receivers (2006-08) at Appalachian State. He additionally came to Cullowhee with coordinator experience at two different high schools as well as two seasons at North Greenville College from 2002-03. While at ASU, Glenn coached six All-Southern Conference honorees, most notably mentoring the two SoCon Offensive Players of the Year in quarterbacks Armanti Edwards and DeAndre Presley. Edwards additional garnered the Walter Payton Award honoring the nation’s top NCAA Division I FCS player. A native of Seneca, S.C., Glenn started his coaching career as the offensive coordinator and quarterbacks coach at Greer (S.C.) High School from 1995 through 2000, helping lead the program to a 25-3 overall record and back-to-back South Carolina Upper-State runner-up finishes in 1999 and 2000. He got his start at the collegiate ranks in 2001 at Elon coaching tight ends before spending the next two seasons at North Greenville College as the offensive coordinator. He returned to the high school ranks for a season in his hometown at Seneca High (2004) before being hired at Appalachian State. Glenn is a 1995 graduate of Clemson University. He is married to the former Anna Thompson and the couple has two daughters – Zoey and Landry – and a son, Hank. Today we kickoff the seventh annual Catamount Sports Forum's "100 days to Football Kickoff Countdown". We hope you have enjoyed the countdown in past years, as much as we do bring it to you. During the countdown, we'll highlight the player who's number corresponds with that day in the countdown. Since the 2017 roster has not yet been posted, we'll use the 2017 Spring Roster until the new roster is posted and then we'll switch to that roster for personnel. In past seasons, some players changed numbers with the new roster, so a player may appear more than once in the countdown, depending on the newly published official roster. Since there is not a player assigned the #100, here's the traditional head coaches' posting. Mark Speir, who has spent the bulk of his collegiate coaching career at the NCAA Football Championship Subdivision (FCS) level, was named head football coach at Western Carolina University as announced by Director of Athletics Randy Eaton during a press conference held in the Ramsey Center on Dec. 22, 2011. Speir (pronounced "spear"), who got his coaching career start at Western Carolina under former Catamount head coach Steve Hodgin from 1991-96, is the 13th head coach of the WCU football program all-time. Since his arrival in Cullowhee, Speir has been a driving force in the revitalization of Catamount football, guiding WCU to back-to-back seven-win seasons in both 2015 and 2014, the latter its first winning record in a decade with the 7-5 finish. It was just the second finish above .500 since 2001 for the Catamounts. Speir led the Catamounts to a second-place finish in the Southern Conference in 2014, its highest finish in the final standings since 1986 -- and just the fourth runner-up finish since joining the league in 1977 -- before following it up with a third-place showing in 2015. For their plaudits, Speir and his staff were finalists for the 2014 Eddie Robinson Coach of the Year Award given at the NCAA Football Championship Subdivision (FCS) level. During the off-season following the success of the 2014 season, Speir was granted a four-year contract extension which was approved by the WCU Board of Trustees in February of 2015. With the extension, Speir is under contract June of 2020. Since taking over as head coach in 2012, 28 Catamounts have earned All-Southern Conference first-or-second team accolades while 16 have earned All-Freshman distinction. In 2014, a school-record tying 14 Catamounts received all-conference plaudits with 13 collecting honors following the successful 2015 campaign. Also, eight players have earned Capital One All-District III selections from CoSIDA with running back Darius Ramsey garnering Academic All-America honors in 2014. Speir's return to Cullowhee in late-2011 came after spending the nine previous seasons at Appalachian State where he was a part of three-consecutive FCS National Championships from 2005-07, serving as the program's recruiting coordinator from 2004 through 2011 while coaching the inside linebackers prior to the move. He also coached the Mountaineers' running backs (2003-04), defensive line (2005-08) and defensive ends (2009-10) while on staff at Appalachian State. In 2009, Speir was tabbed as the NCAA Division I FCS Assistant Coach of the Year by the American Football Coaches Association (AFCA). The award has been handed out every year since 1997 at the five levels of football including the NCAA Football Bowl Subdivision (FBS), FCS, Division II and III, as well as NAIA levels. Prior to Appalachian, Speir also made coaching stops at both at Presbyterian (1997-99) while the Blue Hose were a NCAA Division II member institution, and at Elon (2000-02) the year after the program made the transition to a NCAA Division I school. A native of Kannapolis, N.C., Speir broke into coaching while an undergraduate at Clemson University, working as a student assistant from 1986 through 1989, helping the Tigers to three Atlantic Coast Conference (ACC) Championships during his four years. Following his graduation with a bachelor's degree in secondary education in 1990, Speir landed on Hodgin's staff in Cullowhee, first working with the running backs from 1991-93, then the linebackers in 1994 before coaching the defensive line and serving as the program's recruiting coordinator from 1995-96. Throughout his collegiate coaching career, Speir has made a name for himself through the recruiting process. He has held the title of recruiting coordinator at three NCAA FCS institutions (WCU, Elon and ASU), most recently organizing the efforts that landed Appalachian State six-consecutive crops of freshmen that have been widely considered to be among the top in NCAA Division I FCS recruiting classes and that helped the Mountaineers to three-straight national titles. On the field, Speir has coached multiple All-Southern Conference selections. In all, he was a position coach for nine all-conference honorees that have earned the distinction 13 times in his nine seasons on staff in Boone. Six of Speir's position players have garnered All-America honors during his tenure at ASU including the most recent recipient, linebacker Jeremy Kimbrough, who was selected to the second team by The Sports Network. Additionally, defensive ends Jabari Fletcher, Jason Hunter, Marques Murrell and Gary Tharrington and defensive tackle Anthony Williams combined for All-America honors a total of six times. Speir's most notable pupils, Hunter and Murrell, tied for the SoCon lead with 13 sacks apiece and accounted for six defensive touchdowns between them in 2005. Murrell also led the nation with 13 sacks in `06. Both have enjoyed productive NFL careers, with Hunter entering his sixth pro season this year with the Denver Broncos. Off the field, Speir is involved in many charitable causes. His efforts through Samaritan's Purse have helped raised more than $100,000 to help rebuild the Memorial Christian Hospital in Bangladesh. Part of the fundraising came through his participation in the 2008 Music City Marathon in Nashville, which he finished in 4:01; the 2009 Boston Marathon, which he completed in 3:59; and the 2010 Flying Pig Marathon in Cincinnati. Most recently, Speir completed the grueling 2015 Boston Marathon alongside his brother. In 2009, he traveled to Bangladesh to provide much-needed medical supplies and volunteer at the hospital for 10 days. In 2011, Speir turned to organizing and participating in motorcycle tours as a way to continue to raise funds for the worthy cause. After five years of the motorcycle rides, Speir has helped raise $75,000 for Operation Heal Our Patriots, another Samaritan's Purse initiative. Jerry Moore, the former head coach at Appalachian State where Speir has worked for nine seasons, praised WCU for its decision. "Western Carolina is very lucky to get Mark. He is a perfect fit; he knows Western Carolina and knows it well. 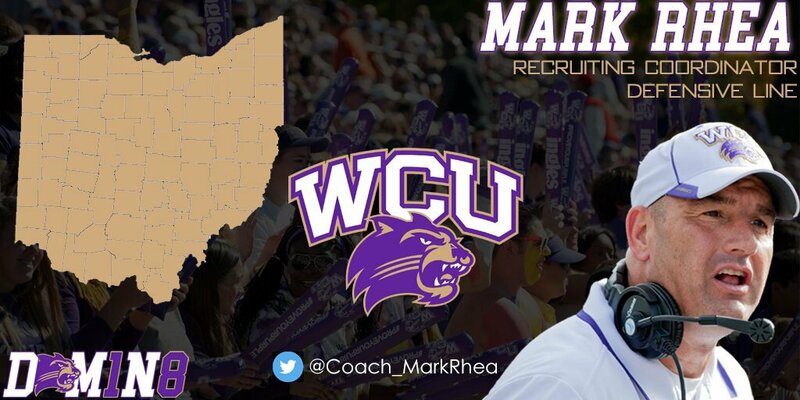 WCU is very, very fortunate to get Mark Speir. He is a great coach, and a better man; he is the kind of guy that you would love your son to go play for," said Moore upon Speir's hiring at WCU. Former Catamount football standout Brad Hoover, who went on to play nine seasons in the NFL with the Carolina Panthers, credits Speir as "... one of the main reasons I went to WCU." "It was because of the level of Mark Speir's sincerity and his positive attitude during my recruitment experience with him that drew me to commit to Western Carolina," said Hoover. Speir is married to the former Paige Holt of Pickens, S.C., and the couple has two sons -- Zeb, who is in his second year at Appalachian State and a walk-on for the Mountaineer football team, and Jackson. Bryson Bowman was selected as the 2017 Southern Conference Baseball Player of the Year by both the coaches & media to headline five Catamounts named to the post-season All-Southern Conference baseball teams. A native of Baton, N.C., Bowman ranked inside the individual top 10 in 10 total offensive categories including leading the SoCon in two -- on-base percentage (.475) and RBI (59), posting a team-best 16 multi-RBI games. His team-leading .389 seasonal batting average ranked third in the SoCon, and he finished the regular season second in slugging percentage (.635) and total bases (134). He enters the conference tournament poised to win the team's Triple Crown for top batting average, RBI, and most home runs (11). When only factoring in league play, Bowman hit a conference-leading .433 as a part of ranking in the top 10 in seven offensive categories. 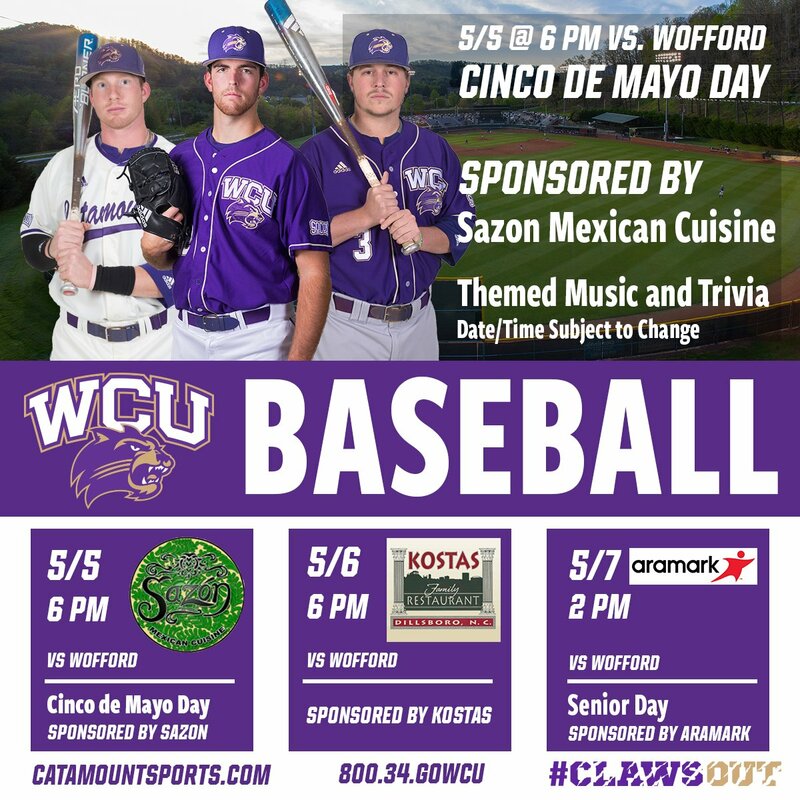 Western Carolina's victory over Mercer on Friday, coupled with UNCG's 7-1 road loss at Samford locks the Catamounts into a second-place finish in the SoCon and a number two seed at next week's Southern Conference Baseball Championship, for the second-straight year. Day 1 // Tuesday, May 23 @ Fluor Field in Greenville, S.C.
Game 1 - No. 8 seed (VMI) vs. No. 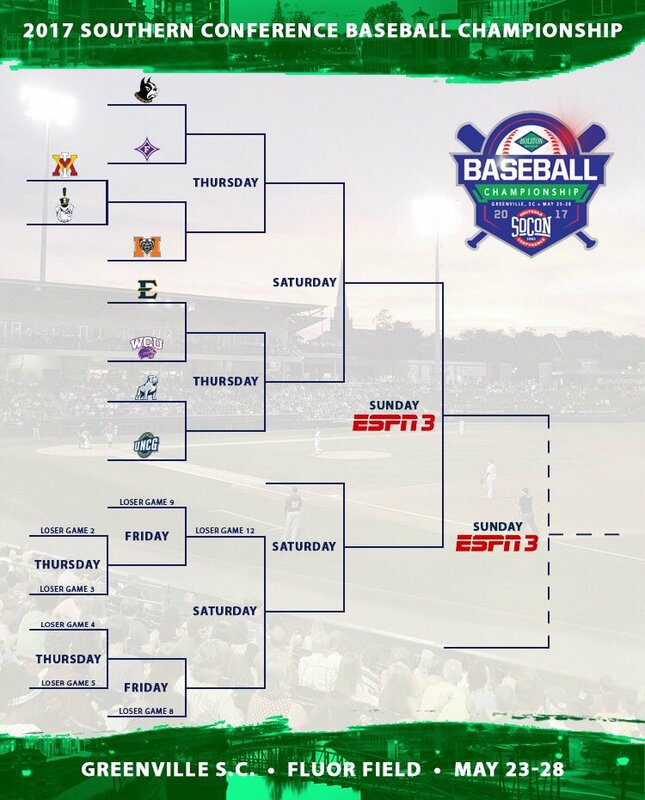 9 seed (The Citadel) 10 a.m.
Day 2 // Wednesday, May 24 @ Fluor Field in Greenville, S.C.
Game 2 - No. 4 seed (UNCG) vs. No. 5 seed (Wofford) 9 a.m.
Game 3 - No. 1 seed (Mercer*) vs. Game 1 winner (VMI-Citadel) 12:30 p.m.
Game 4 - No. 2 seed (Western Carolina**) vs. No. 7 seed (ETSU) 4 p.m.
Game 5 - No. 3 seed (Furman) vs. No. 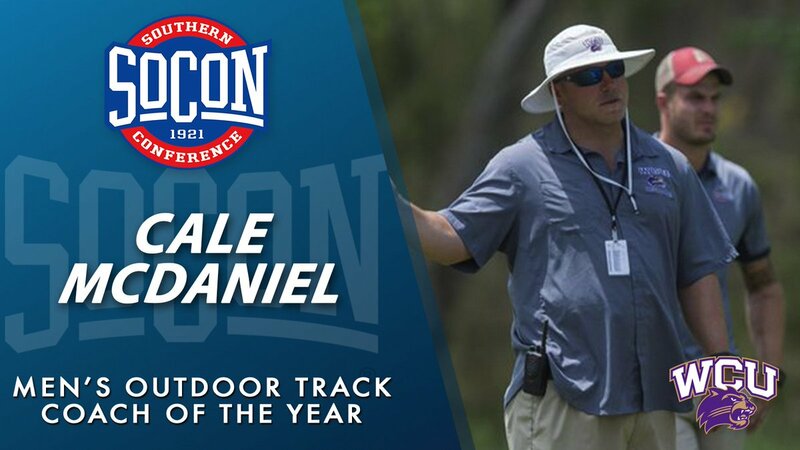 6 seed (Samford) 7:30 p.m.
Cale McDaniel has been named the 2017 Men's Track Coach of the Year! Head football coach Mark Speir has added Reuben Wright to his coaching staff as the running backs coach. Wright, who played collegiately at Catawba College in the early 1990s, replaces former assistant coach Jason Nichols who took a similar position at his alma mater, East Carolina, in late February. Wright officially started in Cullowhee on May 8, and inherits a wealth of talent including three-time 2016 postseason All-America selection, Detrez Newsome. Congratulations to all our baseball seniors who are playing the final weekend home series of their career. 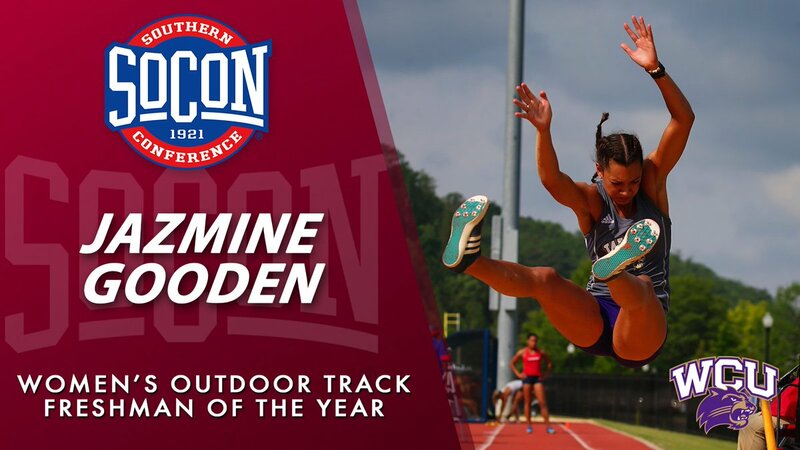 Three Catamount track & field student-athletes were named Southern Conference Athletes of the Week on Wednesday. Juniors Keion Crossen and Mateius Brown swept the men’s awards while senior Hailey Cook took home the women’s field athlete of the week honor. 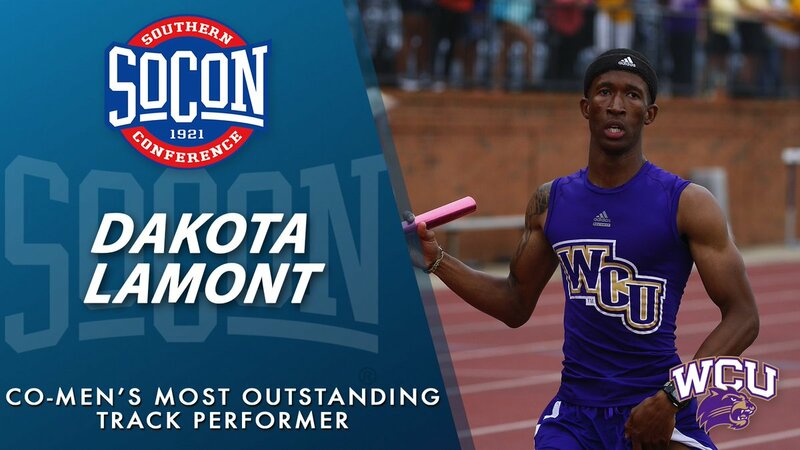 Crossen ran the 100m in 10.38 seconds – a new SoCon-leading time – at the WCU Invitational, Brown won the shot put title at the WCU Invitational, & Cook competed in the shot put, hammer throw and discus throw at the WCU Invitational. She registered a conference-leading throw 15.31m (50-02.75) in the shot put to place second overall, her best mark in the shot put of 15.31m ranks 38th in the East Regional outdoor qualifying list. In the hammer throw, Cook threw for 52.00m, also the top mark in the SoCon this season, to earn a fifth-place finish in the event. In the discus, Cook placed second overall with a best-throw of 43.85m (143-10). With that mark, Cook is currently No. 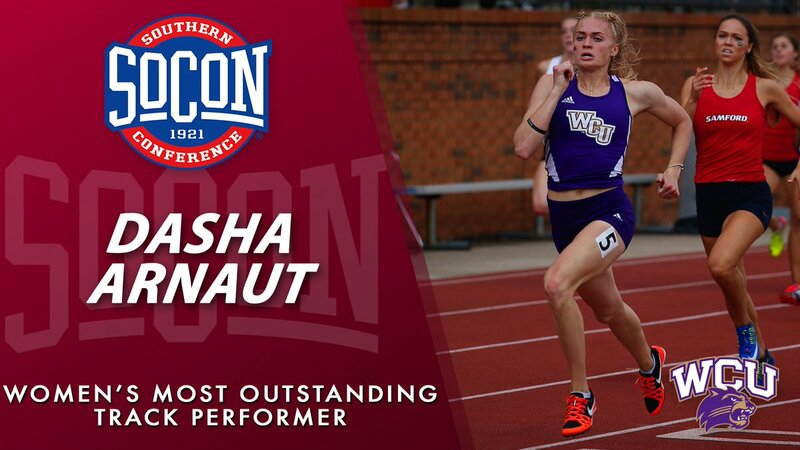 2 in the event among SoCon competitors.